This film is part of the centenary of the First World War. Its main subject is the first great battle the American Marines won in June 1918 at Belleau Wood, at only 90 km from Paris. This battle was, without a doubt, the bloodiest in American Military History before the Second World War. It is considered as “The” battle that gave birth to the Marines Corps as we know it today.Is on this woods, after loosing 7000 of their men, that they became the “Devil Dogs”. Since the beginning of this project, the feedback from the United States has always been really encouraging. On January 27 we were honoured to receive “ The United States World War One Centennial Commission” label. Every year, hundreds of Marines come to the Belleau Wood as a testimony of the importance of this battle in their own history. We have also been given the « Mission centenaire 14-18 » french Label (ministère des anciens Combattants) in april 2014, the writing and documentary development Aid from the Picardie region in November 2014, and the « Aisne 14-18 » label from the the Aisne General council. The WW1HA is going to the battlefields again in May. 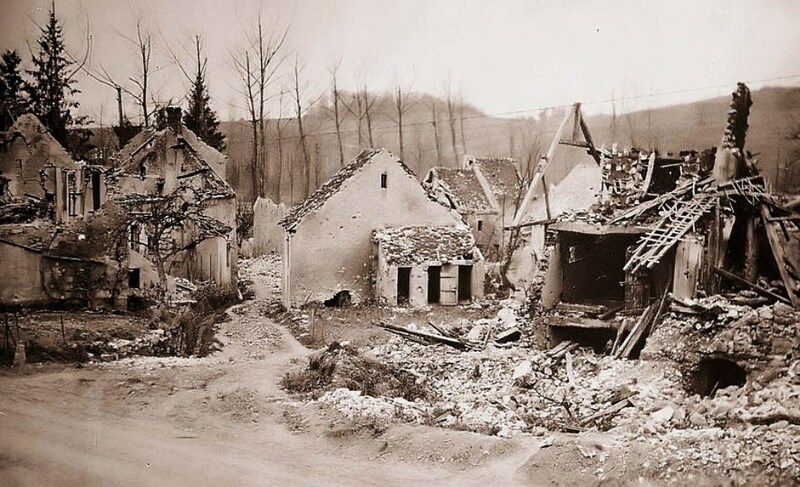 The tour will begin May 25 in Brussels and go to the fortress city of Liege, where brave little Belgium’s army held up the German advance for 12 days at the beginning of the war. The group will move on to the Vosges Mountains in Alsace, to visit the Le Linge battlefield and museum, full of artifacts. More than 2 miles of trenches and fortifications are still in place. On to Hartmannswillerkopf and its incredible views — at nearly 1,000 meters above sea level — and memorials. The American Ambulance Services worked here. Then to Verdun, the St. Mihiel Salient, Belleau Wood, Le Hamel — where American troops fought alongside Australians on July 4, 1918 — and a full day of exploring around Ypres, concluding with the Last Post ceremony at the Menin Gate. To walk where they walked, to stand on the ground they fought so hard for is incredibly humbling. To raise a glass to them while chomping frites — the best fries/chips you will ever eat — with the possibility of chocolate croissants for breakfast is incredibly fun. Come on. I’ll meet you in Brussels and buy you a beer. Friday: I’m at the World War One Historical Association’s national seminar at Quantico. Just heard Graydon (Jack) Tunstall’s talk on the Carpathian Winter War — the Carpathian Mountains are in the Czech Republic, Poland, Ukraine, and Romania. I may have left out a few countries. During WWI, they were fought over by the Russians and the Austro-Hungarians. Jack’s book “Blood on the Snow: The Carpathian Winter War of 1915” is going to the top of my pile! — at Marine Corps Base Quantico. Very interesting talk by Laurence Lyons on George Owen Squier and the development of American tactical radio. To be honest, I was afraid the topic would be too technical for me, but the speaker did a great job of explaining how wireless telephonic communication was invented and kept the human element in focus, too. His book is “Mixed Signals on the Western Front: How the Slow Adoption of Wireless Restricted British Strategy and Operations in World War I.” That is a lo-o-ong subtitle. But wireless communcation would have saved many, many lives on the Somme. Add it to the pile! “The Myths of Belleau Wood,” presented by J. Mark Miller of the USMC Library: The importance of Belleau Wood was the impression it gave the Germans: that the Americans were there to fight. Morale was everything in the summer of 1918 and Belleau Wood gave the Allies a tremendous boost. (I’m paraphrasing.) Marines of today don’t want to let those guys down. I wrote a post about our third talk, but my friend’s computer ate it. Marine archivist James Glincher gave a presentation on early Marine aviation that focused on five pilots who fought in the war. The best detail was the alligator that pilots training in Louisiana made their mascot — and, yes, they did give it a ride. War gator! Kevin Seldon, a former Marine and now a history teacher, presented a selection from his slideshow about the Battle of Belleau Wood told through the experiences of the men who fought there: face after face of those who were killed, gravely wounded or witnesses to terrible combat. In 2002, Seldon met and talked with the last survivor of the battle, then 105 years old. Saturday. Last night Scott Stephenson, a professor of military history at the Army, gave a lively talk about the final days of the war and the poor guys who had to tell the Kaiser that he didn’t have the troops to march into the homeland and defeat the revolutionaries. And by the way, you just abdicated. Stephenson’s book is “The Final Battle: Soldiers of the Western Front in the German Revolution of 1918”; it won the 2011 WW1HA Tomlinson Prize for best book in English about the Great War. Richard DiNardo, professor of national security at the Marine college, gave a lively talk on the German/Austro-Hungarian/Bulgarian attack on Serbia in 1915. Of course the Serbs were beaten back — Serbia suffered more than 70 percent casualties in the war. The Germans and Austro-Hungarians were set on getting a path through Serbia to get supplies to Turkey. The Serbs rereated, the attack was concluded — and Germany and Austria-Hungary began the squabbling that eventaully destroyed their alliance. DiNardo’s latest book is “Breakthrough: The Gorlice-Tarnow Campaign, 1915.” Top of the book pile! Patrick Mooney of the National Museum of the Marine Corps speaking: We just suffered 83 percent casualties as the 1/5, 4th Marine Brigade, trying to capture Blanc Mont Ridge on Oct. 4, 1918. There’s a very beautiful monument on Blanc Mont to the Marines and the 2nd Infantry Division. Geoffrey Rossano has written several books on Naval aviation including “Stalking the U-Boat: US Naval Aviation of World War.” He’s speaking about U.S. Naval aviators who served with the British in the WWI. Many interesting photos of airfields, planes and rosters. Nic Galvan Gunnery Sgt has us all tasked with taking Hill 142. First we were the major, and now we’re Capt. Hamilton and our Marines are lying in a wheatfield getting their packs shot off their backs. He keeps barking, What are you gonna do, SIR? Well, we do eventually win the war, so I guess things will work OK (at least for some of us). And that, sadly, was that — until next year! I”m temporarily abandoning a book for a while. I never ever do that — with one notable exception — I usually just ditch them. Life is too short to read bad books. But Farwell’s “Over There: The United States in the Great War, 1917-18” is really good. It’s just that I’ve gotten to the part when the 28th and 30th Divisions are about to attack on the Chemin de Dames, and I’ve realized what short shrift Farwell gives to Belleau Wood. We win that battle next Tuesday. So now I’m all hot to read “Miracle at Belleau Wood” and any other account in my library. 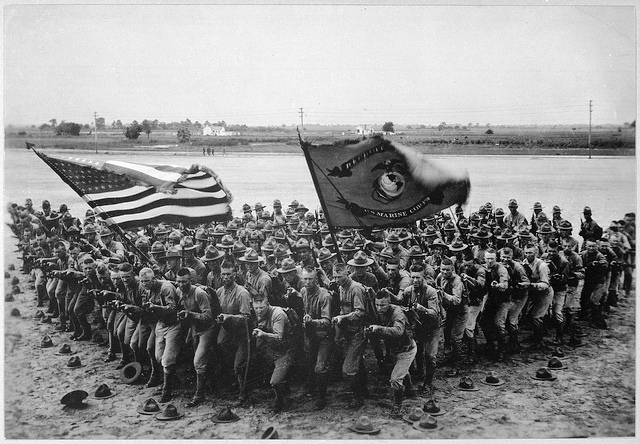 “First to Fight.” A group of U.S. Marines. US Marine Corps Recruiting Publicity Bureau., 1918. From the U.S. National Archives. Also, here’s a post at blog History & Lore of the old World War about an unexpected memoir: “At Belleau Wood with Rifle and Sketchpad” by Louis Linn, a Marine who fought in that iconic battle and at Soissons and St. Mihiel, where he was gravely wounded. There was a wheat field, but more important, there was a wood full of German machine gunners. The advancing Germans, in the last push of their third offensive, were about 50 miles east of Paris when they met American Marines at Belleau Wood. The terrible fighting went on till June 26, when the Marines officially held the woods. The famous quote, by the way, comes from Capt. Lloyd Williams, who was killed in the fighting. Here’s a book that might intrigue you, especially those of you interested in the U.S. Marines.